Santa is Missing is a children’s book. It is short, and easy to read. I am presenting it to you as my gift. The story is very adult like in composition since the view-point changes every chapter. Children twelve and older will have no trouble reading it by themselves. Kids younger than twelve may need it be read to them. 5. Sentra-vision, a special belt worn by Morty. It is a communication device used to call heaven. 6. Sky-scooter, a special flying scooter given to Morty by friends. Since he cannot fly like other angels he needs the Sky-scooter to travel. It has amazing properties. 8. Major Joe ‘Do-Do’ Taylor is an Air Force pilot at Elmendorf Air Base. 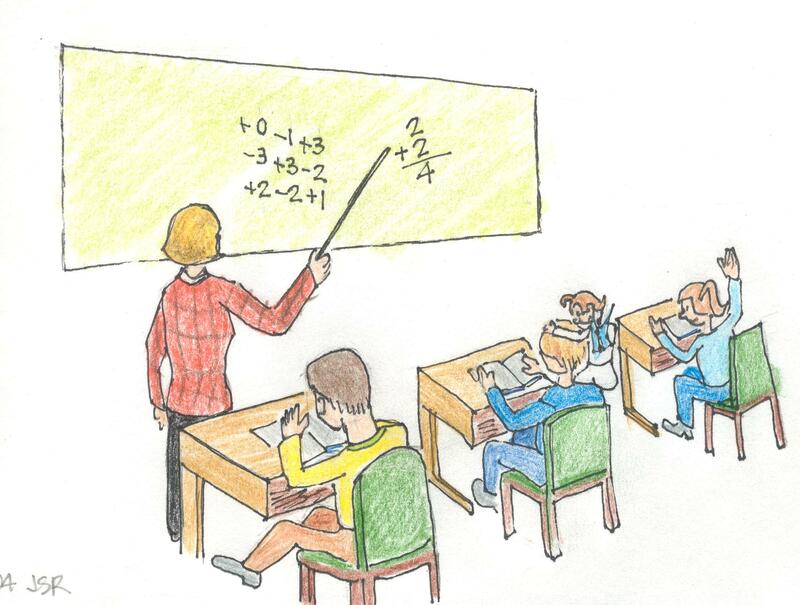 There are ten chapters and I will present one chapter every day or two until the story is complete. There are cartoon pictures scattered throughout the story. The cartoons are originals done by Grumpa Joe. Morty sat invisible on Ben’s shoulder. He watched the snow falling gently. Ben listened to Miss Brown. The temperature dropped since they got to school this morning. Ben looked out the window and wished he could be playing in it. Miss Brown went over math sets. There were two more days before school let out for the Christmas holiday. Morty’s head bobbed with sleep when his wings fluttered. He jumped to attention as his wings fluttered again. “God is paging me,” he said to himself. Morty raised the end of his Sentra-vision belt to his eye. He saw Gabriel sitting at the desk outside God’s office. He squeezed the belt to signal that he was ready to receive. Gabriel pushed a button on his console and God appeared. Morty watched and listened carefully. The bell rang just as God finished the message. School was over for the day. Ben rushed to get his boots and coat. He ran out of school with his Guardian Angel hanging onto his sleeve. Ben jumped into the deep new snow, and fell backwards. He swept his arms above his head and spread his legs apart. Ben climbed on and wrapped his arms around his guardian angel. Morty set the navigator for the North Pole, then pushed the thrust button. They were out of sight in an instant. MORTY ANGEL AND BEN HAVE BEEN ORDERED TO LOOK FOR SANTA WHO WAS REPORTED MISSING. Santa is never late said Mrs. Claus to herself. She paced back and forth wondering where he was. “Santa keeps a strict training schedule. They have to be in perfect shape to be able to deliver all the gifts. They fly fast, stop on a roof, then start-up fast again. They pull all the presents, and Santa is not a light weight. I keep him on a diet, but poor Santa never loses a pound,” said Mrs. Claus. 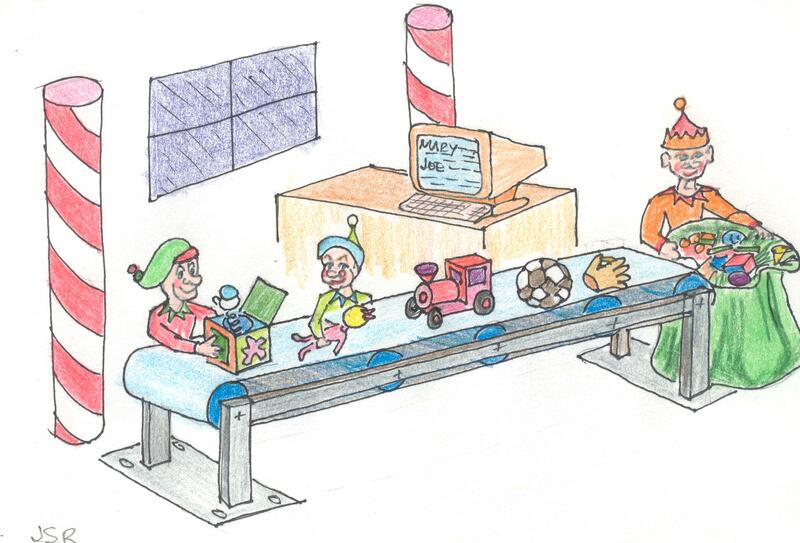 The elves were still very busy making toys and wrapping presents. 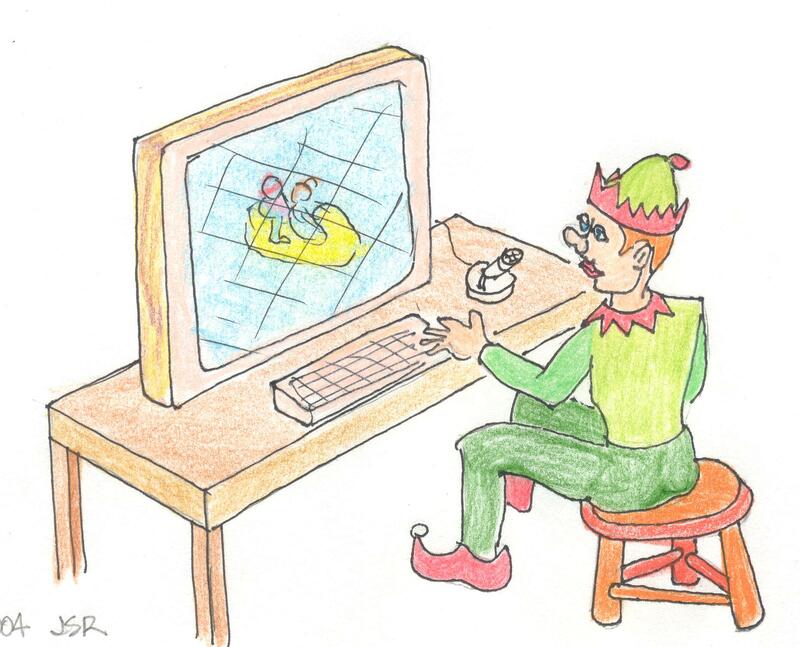 They used Santa’s computer to know how many toys to make. Before Christmas, Santa visits children all around the world to ask them if they were bad or good. If they answer “good,” he asks them what they want for Christmas. Each kid gives him a list of toys. Of course, Santa already knows if they were bad or good because he has Sentra-vision like the angels. He keeps a record of all the good deeds and all the bad things that a kid does on his computer. Elf-Jasper was charting Santa’s route and connecting each gift to a child’s house. He was ready to download the chart into the tracking system on the sleigh when Mrs. Claus asked him to look for Santa. Jasper ordered his elves to hitch the back-up team to the red sleigh. They left to search all of Santa’s training routes, but it was snowing so hard and they could not see anything. 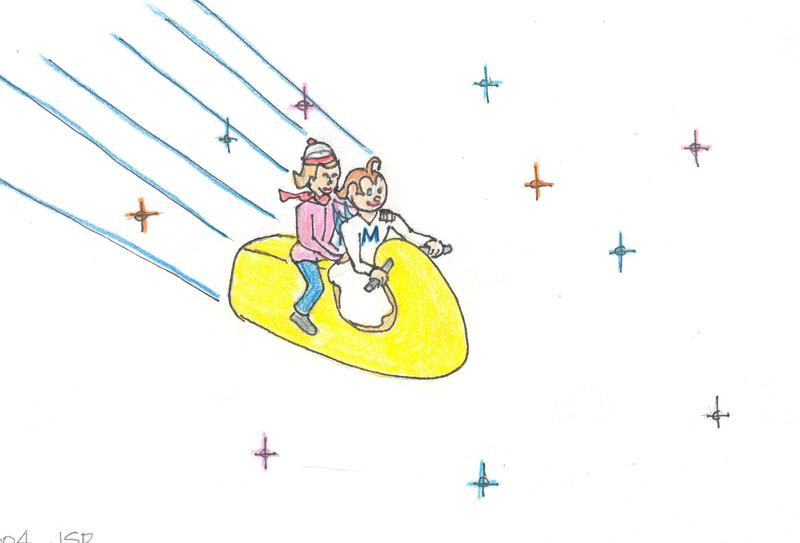 Ben and Morty Angel are rushing to the North Pole to Find Santa aboard Sky-scooter. Ben and Morty hung onto the scooter as it sped to Santa Claus Village near the North Pole. Morty used his Sentra-vision belt to get information about the mission. He learned that Santa was missing on a training mission, and the elves could not find him in the snowstorm. Morty wondered how he was going to find Santa. Ben must have read his mind. “Great idea,” Morty shouted over his shoulder. They were traveling so fast the noise from the wind and snow made it hard to hear. The Scooter, automatically began to slow down and lose altitude. The voyage to Santa’s Village was nearly over. Morty called Jasper to ask for help. “Jasper, please contact Gabriel. Tell him to spread the word to the animal kingdom. Have them report all suspicious activity. “Make a special call to the wolves to search for the reindeer with their noses. They have a keen sense of smell and can tell when an animal is hurt. If the reindeer are injured, the wolves will find them,” said Ben. Jasper locked Sky-scooter onto the landing beam. Then, he relayed the message to Gabriel. Morty and Ben begin the plan to find Santa as they fly to the North Pole. High on a Mount Denali glacier, deep in a dark crevasse, Santa crawled out from under the green sleigh. He checked himself for broken bones and brushed snow off his suit. He started a roll call. “Comet,— Comet, does anyone see Comet?” asked Santa. “We are okay,” they answered in unison. “Why did we crash?” Asked Cupid. “Comet is waking up,” said Prancer. “We crashed into a crevasse,” answered Prancer. “Let’s put our heads together and see how we are going to get home,” said Santa. 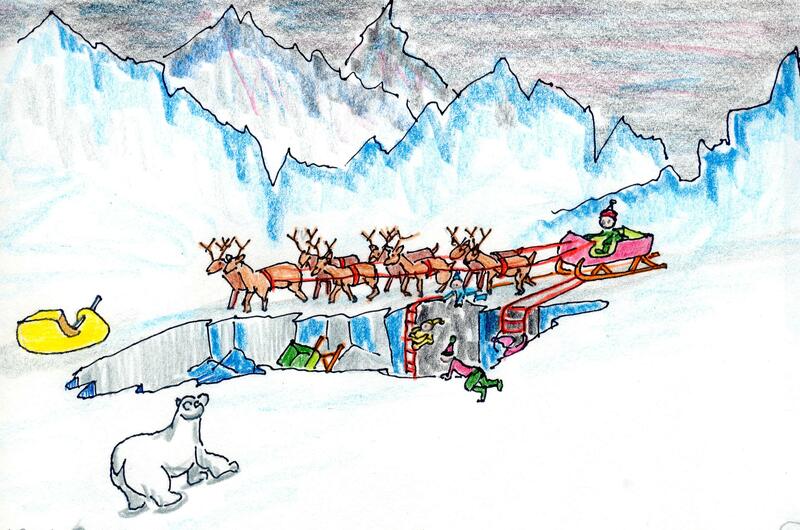 SANTA CRASHED INTO A GLACIER ON MOUNT DENALI AND IS LOOKING FOR A WAY TO GET OUT. Sergeant John Jacobs watched the radar at Fort Greeley missile base. Sargeant John served at on the far edge of Alaska. Everything appeared normal until eleven o’clock. At eleven the screen started flashing, and the horn sounded. John nearly jumped out of his seat. A strange blip headed toward North America at very high speed. He knew what all the other blips on the screen were, but this one behaved different. Could it be a missile coming in? He checked the equipment. Everything was normal. The blip kept coming. John picked up the red phone and dialed Elmendorf Air Force Base. “I’ll be there in a flash.” Major General Holmes was at home decorating his Christmas tree when the Sergeant called. Minutes later, Major Holmes saw the blip on the radar screen himself. The object was near the coast line now. “Scramble the tactical unit,” he ordered. Elmendorf confirmed the unidentified object approaching U.S. airspace. It was too fast to be an airplane. It had to be a missile. Three F16 jets sped toward the blip. “It looks like we’ll intercept it over Denali,” Radioed Major ‘Do-Do’ Taylor. On this evening Santa took the team to Siberia. He was returning to the North Pole from the extended training flight. The reindeer were at peak condition. Rudolph and the team were feeling good. Santa knew they were ready for Christmas Eve. They would deliver presents to good kids all around the world. The team was excited. It felt good to fly fast. They loved speed. Santa was anxious to get home early. He and Mrs. Claus still had gifts to wrap for the elves. Mrs. Claus knitted new caps and socks for them. The F-16‘s approached Denali, the highest peak in North America. A heavy cover of clouds hid the mountain, and the pilots flew by radar. Major Do-Do spotted the object on his radar. It flew under the clouds. 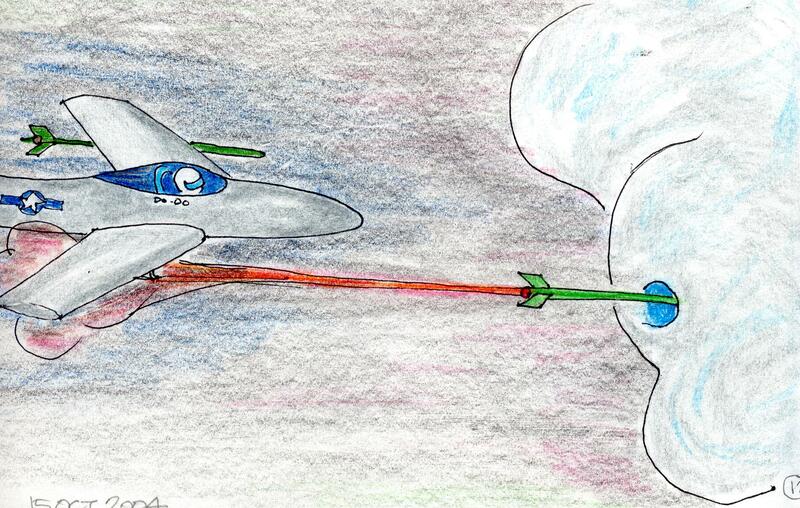 Most of the time the jets flew above the clouds where the the pilots could see the stars and the moon. This flight was different. Major Do-Do used pilot nicknames to talk to his wingmen. “I see it too,” said Dogface. All three jets sped up to sixteen hundred miles per hour and broke the sound barrier with a loud bang. “Did you hear that?” shouted Santa. “I don’t know,” answered Santa “Maybe it is the ice cracking on the glacier below.” Just then, Santa let the reindeer have some fun. He flipped the reins gently, signaling them to go faster. The sleigh jumped forward. The team loved going fast, the faster the better. Even at this high speed they were barely breathing hard. They could go even faster if Santa asked them to. “Get ready to practice a high speed landing,” said Santa. “Okay,” responded Rudolph, “Let’s have some fun.” Neither Santa nor the reindeer had any idea that they were being chased by the jets. Just as Santa gave Rudolph the signal to speed up, Major Do Do received orders to shoot. He fired a missile without knowing that he was shooting at Santa. The rocket was just a few yards behind the sleigh when the team kicked into high gear, and shot forward. They flew faster than the missile. Santa signaled the landing maneuver. Rudolph turned them into a sharp upward loop. The team was at the top of their loop, flying upside down, when the rocket exploded. It blew up just as they curved downward. The explosion caused Rudolph’s nose-light to go out, and knocked them off course. “Oh oh, this is going to be ugly,” said Rudolph. The confusion caused the team to drop hard and fast. Do Do, Crackers, and Dogface saw the object disappear from their radar. 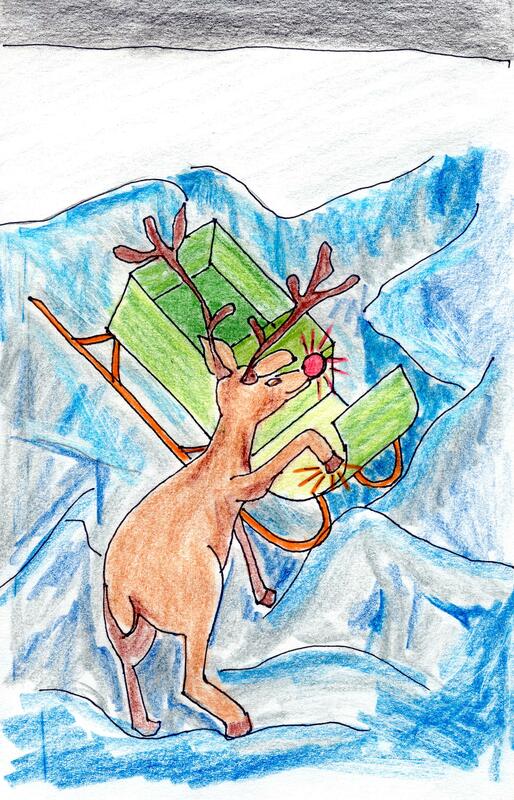 Rudolph pulled the team out of the loop onto the glacier at top speed. The reindeer skidded and plowed a trench in the snow. Rudolph went down. The team tumbled, rolled, and slid behind him. Dasher clipped a large chunk of ice and shattered his leg. Comet banged his head and went unconscious. After sliding and plowing snow for what seemed like an eternity they disappeared into a deep crevasse. 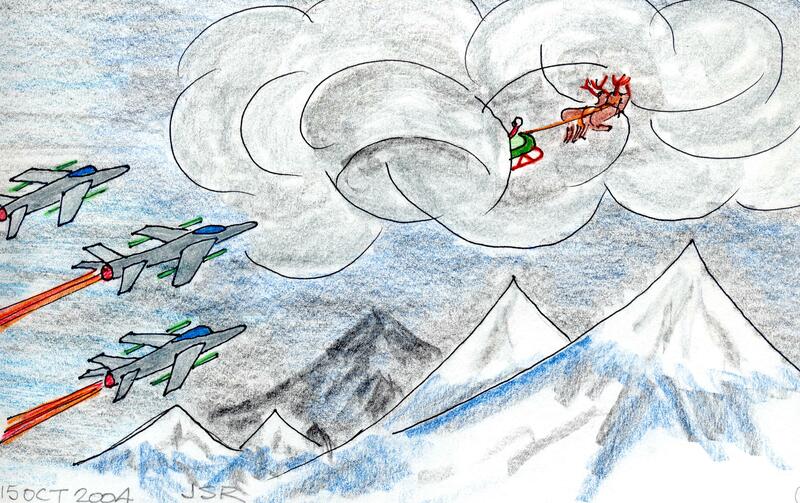 The Air Force spotted Santa, but thought he was a missile. They fired at the team, but they out ran the missile. The maneuver caused them to crash-land on Denali, and to disappear from all radar. At the North Pole, Morty and Ben set up a communication center. Ben opened a map of the world and pinned it to a wall. He marked the location of every report that came in from the animal kingdom with a push-pin. The messages began coming in immediately. 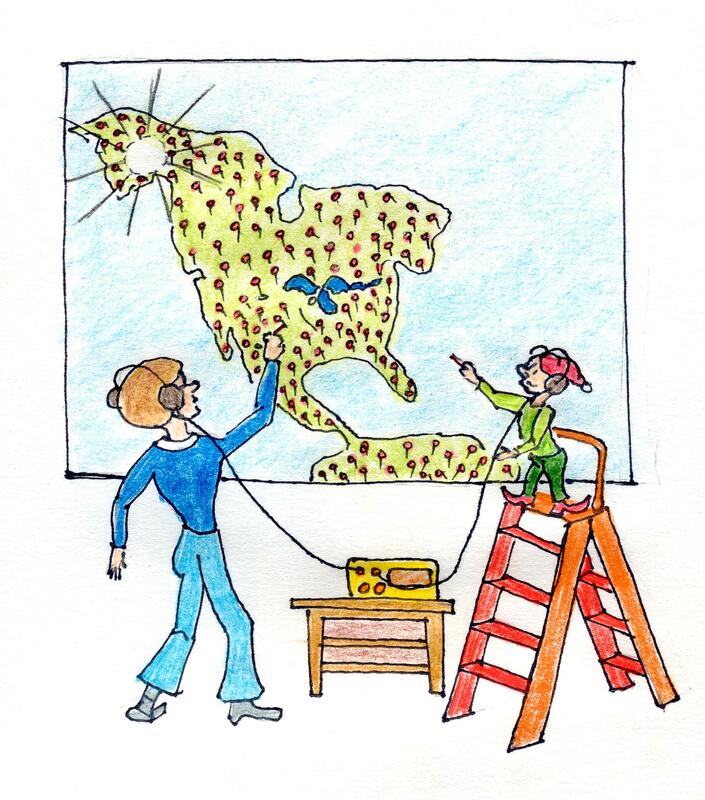 Most reports were “nothing sighted, scented, or heard in our sector.” If a spot on the map looked empty, Morty called the animals in that sector and asked for a report. Soon the map was filled with red push pins. There was one bare spot on the map. It was in Alaska. It was snowing very hard all over the state and the snow kept the animals from moving around. Gabriel paged all available angels and sent them to look. Each angel was assigned a sector, and was asked to report unusual activity. The grizzly bears were hibernating, so they were out, and the wolves, elk, sheep, and goats were all down at lower levels for the winter. The highest points of the mountain were assigned to the bald eagles, but they had to wait for the morning light and for the snow to stop. Mrs. Claus began to cry. Ben took her to the kitchen to make some tea. There, in the kitchen, he spoke softly and assured her that if anyone could find Santa, Morty could. Morty studied the map with Jasper. There were red pins everywhere. Where could Santa be? “Do you see what I see?” asked Morty. He called Gabriel over the Sentra-vision. “I will get back to you as soon as I find her,” said Gabriel. Just as he promised, Gabriel called back with Polly’s location, “she is on an ice floe near the North Pole.” He down-loaded her location into Sky Scooter. “Let’s get going,” said Morty. Together, they boarded the scooter. Morty hit auto pilot and they were off to find Polly. It was still snowing hard when they left. 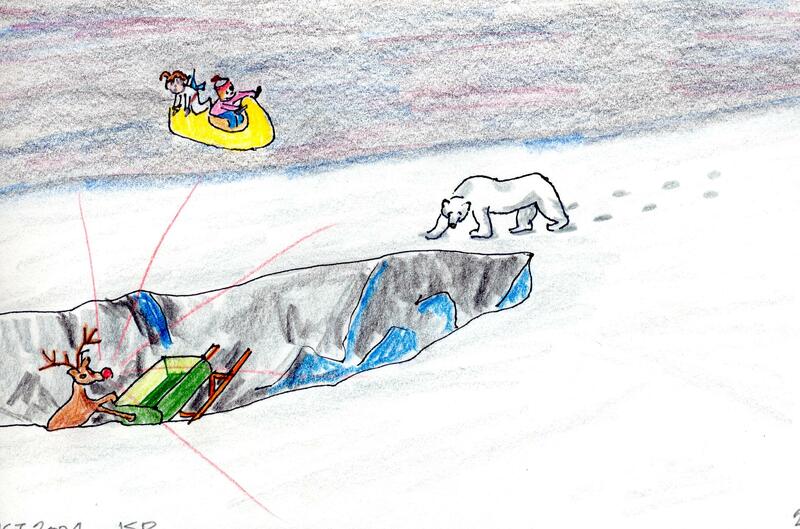 Polar bears love the cold, and Polly was on an ice floe hunting for seals. Morty landed on the ice right next to her. “I haven’t seen you since last year, what brings you here on a night like this?” asked Polly. “Santa is missing and I need your help to find him. We think he is lost on Denali,” said Morty. “I know, I called in my report earlier,” answered Polly. The three of them squeezed on the scooter, and took off. On the way, Morty called Gabriel. Morty and Ben have picked up their friend Polly Polar Bear to help with the search for Santa. Morty landed on the top of Denali. Polly jumped off and put her nose into the air. “Nothing human or animal, but I do smell something, it smells like fire,” said Polly. “Polly, you scout this side of the mountain, Ben and I will fly to the other side. I’ll check with you later. “Ben, you drive the scooter, and I’ll look for Santa. With that said, Ben and Morty left to start their search. Polly zigzagged going down. The smell of the fire got stronger. She changed direction and the smell grew weaker. After the third pass, she was certain the smell was stronger on the West side. “I’ll stay on the side where the smell is strongest, and cut my slide time in half,” she said to herself. 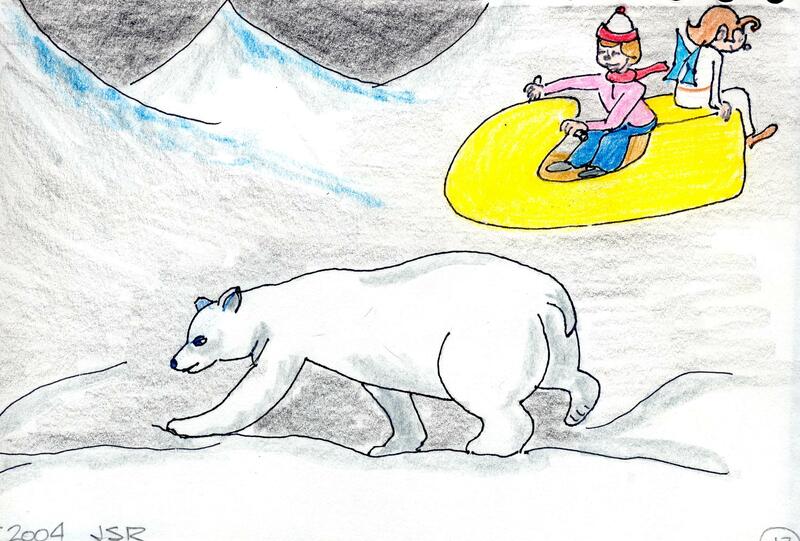 The big polar bear continued sliding, but now she only went half the distance. On her fifth pass the scent was very strong, and she saw disruptions in the snow. Those look like tracks that have been snowed over. I’ll stop here and wait for Morty to check in. Ben and Morty flew back and forth down the opposite side of Denali, and saw nothing unusual. “It’s time to check on Polly.” Ben pointed the scooter to the top of the mountain and over to the other side where Polly was waiting for them. 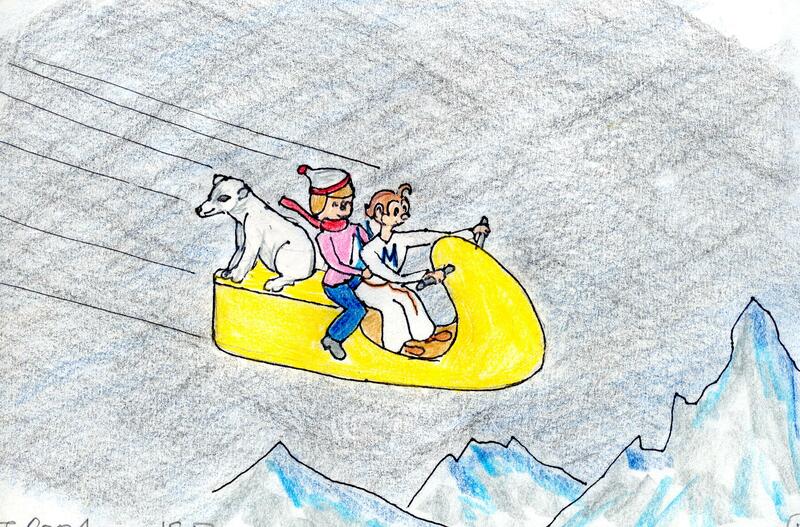 Morty, Ben, and Polly split up to search for Santa on both sides of the mountain. Polly finds something suspicious. 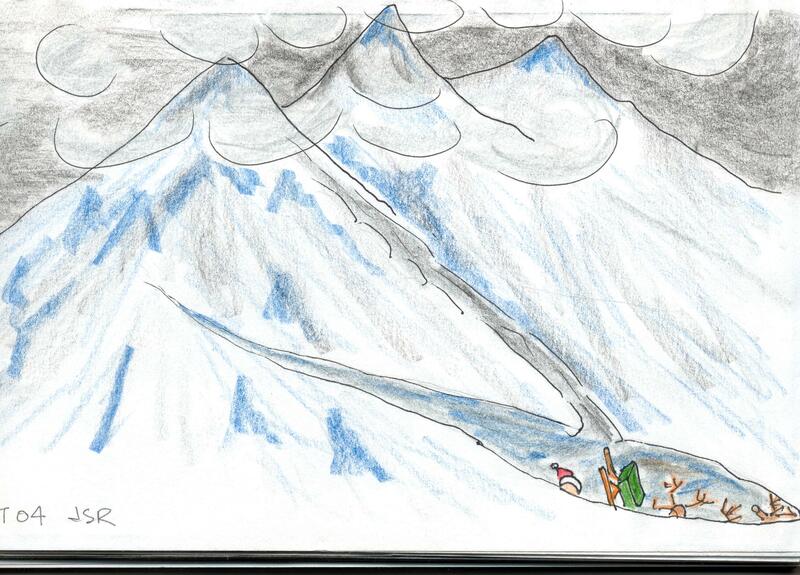 The big snow storm covered over the crevasse, making it impossible for Santa and the reindeer to see. Donner and Dancer returned from their exploration. There was no way out, except up. Rudolph worked on the Sentra-vision unit with Santa. They could not make it work. Rudolph stomped his hoof against the dashboard in frustration and to his surprise his nose lit up. “Santa, watch this,” he said. He held his hoof against the dash and his nose glowed red. It didn’t light up as brightly as it did when he was leading the sleigh, but it was bright enough to give them some light in the crevasse. Ben and Morty crossed over the peak of Denali and started down to look for Polly. “Did you see that?” asked Ben. Ben landed the Sky-scooter next to Polly. 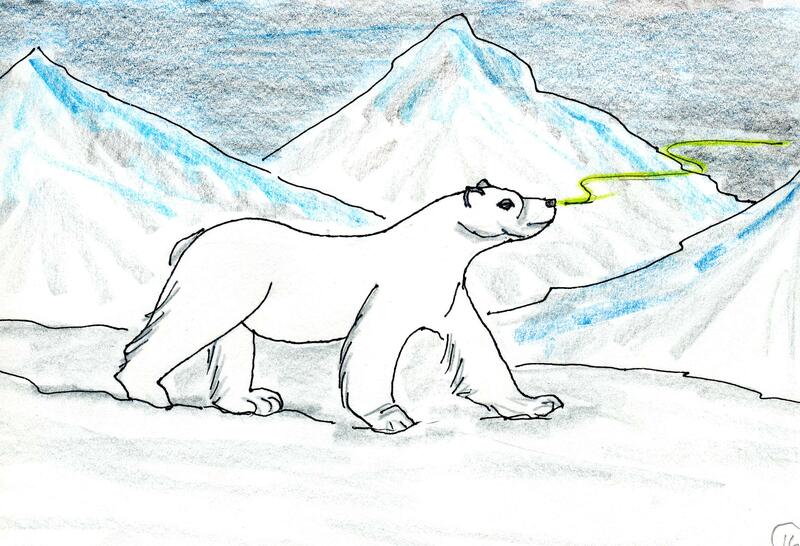 “I’m glad you finally came, I found something interesting in the snow, and a few seconds ago I thought I saw a red glow in the snow up ahead,” said Polly. “I saw it too,” said Ben. Polly walked slowly down the glacier with Morty perched on her back. She followed the tracks, then suddenly she stopped. “There is a hole in the snow with a red light coming out of it,” said Ben. Polly took a few steps forward. She stopped abruptly, and backed up. Suddenly, the snow covering the crevasse began to cave in revealing a deep canyon in front of them. The falling snow-bridge nearly buried Santa and the team. Rudolph was up to his antlers in snow and couldn’t move. “I need some help to dig Rudolph out of the snow pile, come here quickly,” called Santa. Cupid started jumping as hard as he could and soon freed himself. He sprang up and over to Rudolph and started moving snow with his antlers. Santa was on the other side digging with his hands. Morty got on the scooter with Ben and looked down into the crevasse. He saw Santa and Cupid shoveling snow off of Rudolph. Morty took Sky-scooter high over the crevasse in a big arc. He nosed downward and tapped the thrust button. Sky-scooter swished down into the crevasse at supersonic speed. Just as he was about to hit Santa, Morty pulled up, and steered the scooter out of the crevasse. The scooter created a vacuum and the snow that fell came flying out after the scooter. It looked like a giant white tail on the end of Sky. The snow arched up and over Polly’s head and landed into a huge pile. “Gabriel, we found Santa. Send Jasper with the rescue team. They are trapped at the bottom of a deep crevasse,” radioed Morty. 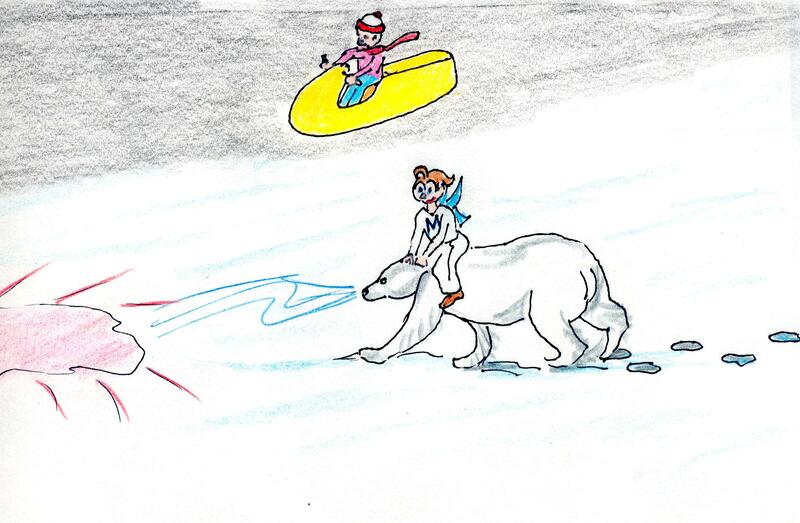 IN THE LAST CHAPTER, THE SEARCH TEAM SPOTTED A MYSTERIOUS RED GLOW IN THE SNOW. THEY DISCOVERED SANTA ON THE BOTTOM OF A DEEP CREVASSE THAT WAS COVERED BY A SNOW BRIDGE. Mrs. Claus breathed a big sigh when the news came. The elves cheered. Jasper left immediately with the rescue team. He followed the signal sent by Sky-scooter. The Red Team landed on the edge of the crevasse. The elves jumped into action with rope ladders and lifting equipment. “Take care of Dasher’s leg first, then Comet’s head,” said Santa. Four elves found Dasher, put a sling around his body, and gently lifted him up to the sleigh. Albert Elf placed a compress against Comet’s head, and Mercy bandaged Prancer’s bloody shoulder. It was Prancer’s blood that Polly smelled. The Red Team raced back to the infirmary at the North Pole with Dasher, Prancer, and Comet then returned. The elves lifted Santa and the reindeer out of the crevasse while they were gone. 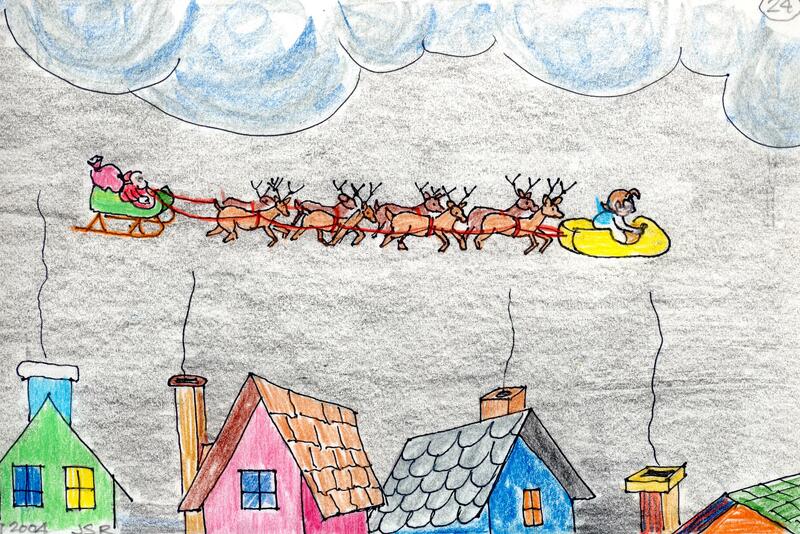 Only one more thing had to be rescued; Santa’s favorite supersonic sleigh. 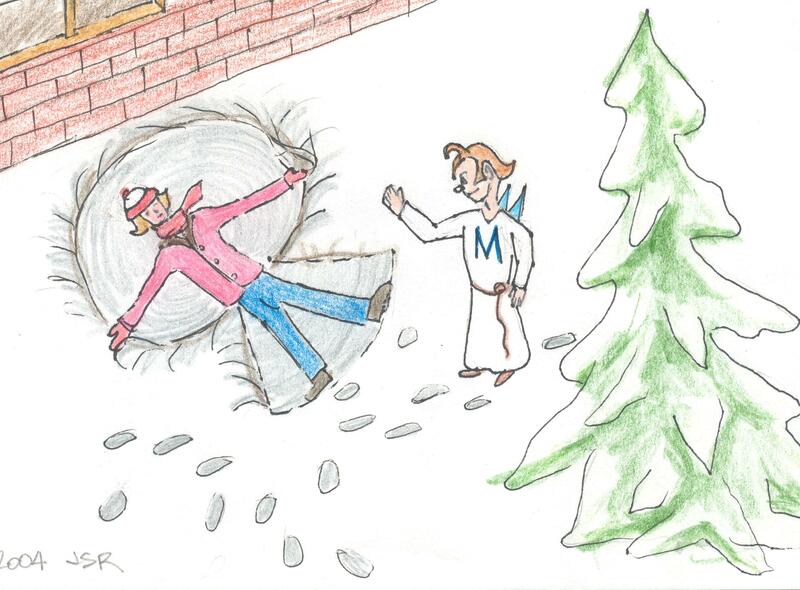 The sleigh was wedged between the walls in the deep split. Neither Santa nor Morty could budge it. Ben came to the rescue again. “I’ll tie a rope to the runner and you tie the other end to Sky-scooter,” he said. Ben shimmied down a rope into the crevasse. Morty looped a rope around Polly’s neck. Ben tied the other end to the runner. 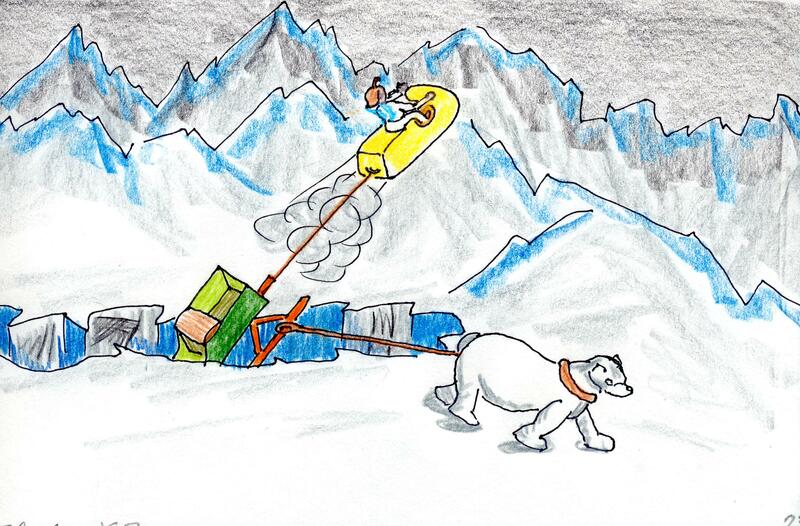 “Pull hard Polly,” said Morty, “pull really hard.” Polly pulled with all her might, and the sled moved a tiny bit. Ben pushed on the sleigh from another direction, and loosened it some more. “Pull again, Polly,” said Morty. Polly strained and the sleigh started to move up the wall. “I can’t hold it,” she said. “Ben, is the rope tied to the runner? Morty pushed the thrust button for power. She pulled as hard as she could. 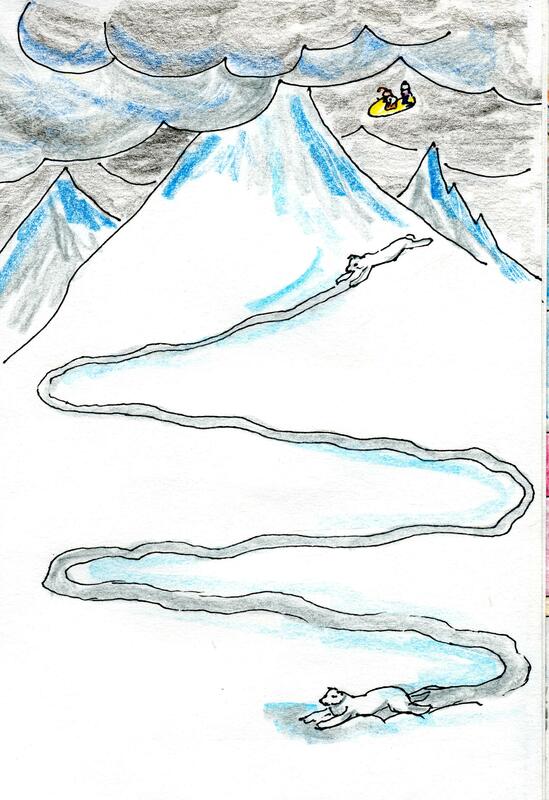 On the other side of the crevasse Sky-scooter made a long loud roar, and the sleigh inched out of the hole onto the glacier. In the last episode, Ben and Morty rescued Santa and the reindeer from the bottom of the crevasse. Morty rushed Santa back to the North Pole. 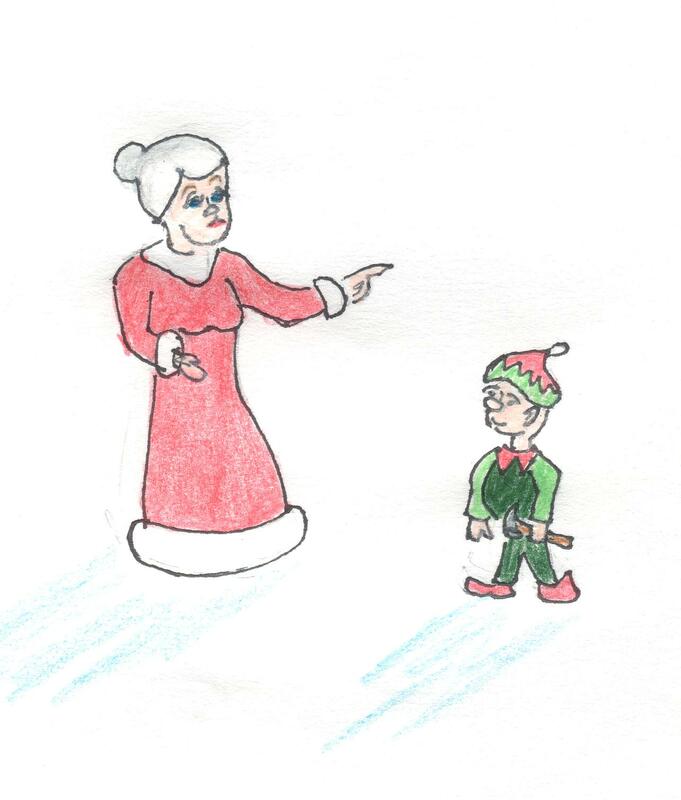 Polly said she would find her way back alone, and Ben returned with the elves. 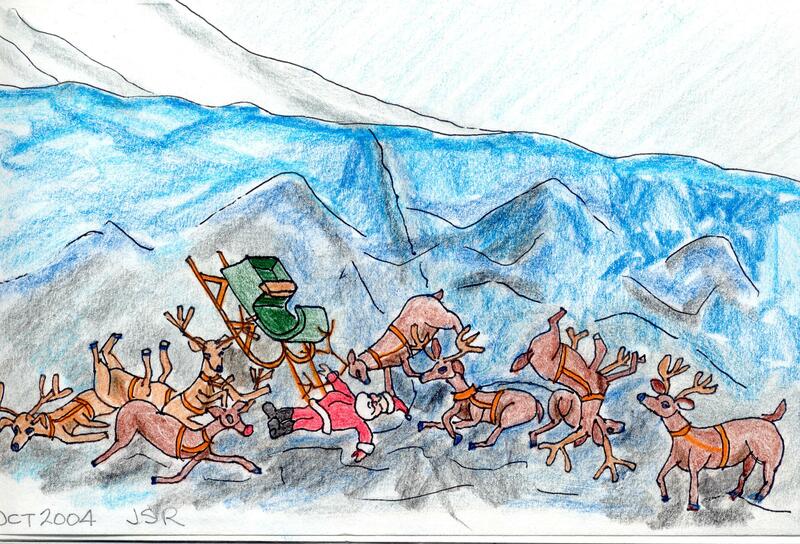 Mrs. Claus and the elves had a back up sleigh packed and ready to go, but there was still one problem. Santa didn’t have a replacement light for Rudolph’s nose. By this time, Ben arrived. “Can I come too? He asked. Morty helped Santa complete the delivery of Christmas presents to good children all around the world to celebrate Jesus birthday. As Morty led Santa from house to house, Ben slept. He was cozy and warm in his bed dreaming of how he helped to rescue Santa from the glacier. He remembered having tea with Mrs. Claus and assuring her that Morty would find Santa. On Christmas morning, Ben awoke and ran into the room where the Christmas tree stood. There were presents piled everywhere. Morty was there too. He sat on a pile of packages with Ben’s name on them. He yawned, and stretched his arms out wide. Ben dove into the presents and started tearing them open. Morty thought to himself, I’m really tired. The trip with Santa was a great work out. I wonder how he does it every year? Hunched down low in the first row in front of Boko were Aga Bam-bi, and Ali Bug-Bunee. Aga munched on a clover flower while Ali nervously scanned the garden for signs of Grumpa Joe. Ali twisted and twitched his ears in all directions. His eyes open wide scanning the garden for movement while his nose was a constant twitch. Both Aga, and Ali suffered a devastating winter living in dire conditions of deep snow and brutal cold. As leaders of terror cells their focus shifted to survival, and not in terrorizing the garden. Little did they know that in their quest for food that had stripped the young bark off the Viburnum and the Willow shrubs causing them great stress. Missing from the meeting were the squirrels. “They took a terrible beating from the hawks,” said Aga. Behind Aga and Ali sat Slimy the Slug, a new member of the organization. Slimy sat nervously hoping the meeting would end quickly. He needed darkness to carry out his work, and this meeting cut into his feeding time. 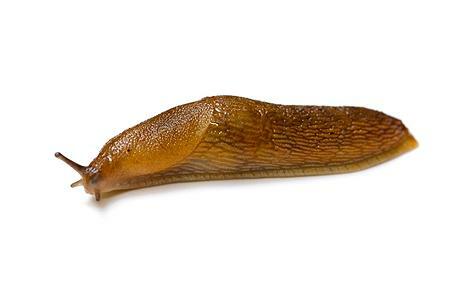 Unlike the Wabbits, Slugs can not work in sunshine. The sun quickly dehydrates their vital fluids and kills them. “He hasn’t planted any Petunias yet this year,” said Ali. “The tulips are all bloomed out so there is little left for us to raid,” spoke Aga. “We will stand together,” they answered in unison. “Good. As soon as we know what his Monet Vision looks like we will strike terror into the old man’s life. “That’s a good idea,” said Peggy. “What is that,” she asked? Grumpa Joe got a very late start on planting because of all the travel he and Peggy did. First, they had to return from the Valley and then they had to go half way back across the country to attend the graduation ceremony of Grumpa Joe’s grand-daughter. Before they left, he spent most of his time pulling weeds and preparing the flower beds. 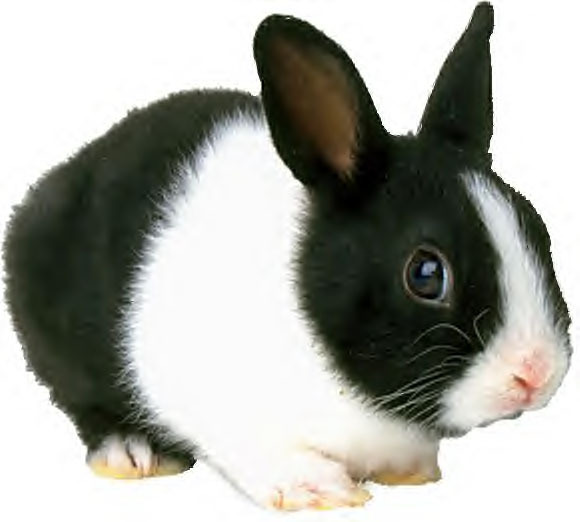 When GJ returned home and walked around his garden he spotted Aga Bug-Bunee chewing peacefully on clover flowers. Eat all of that you want he said to himself, but stay away from my annuals. After the graduation, Grumpa went on a flower buying spree. He bought a variety of Marigolds in yellow, orange, and mixed. This will fix them he thought. Those fuzzy Wabbits will stay away. I think it is the smell that does it. In his day dreaming he envisioned a garden of yellows and golds of many sizes shapes and textures. Right after he planted his first batch of marigolds, he went on a second flower safari and bought more marigolds but also daisies, zinnias, some low growing Lysimachia, a full flat of tall skinny Celosia, and a spicy orange Asiatic Lily. 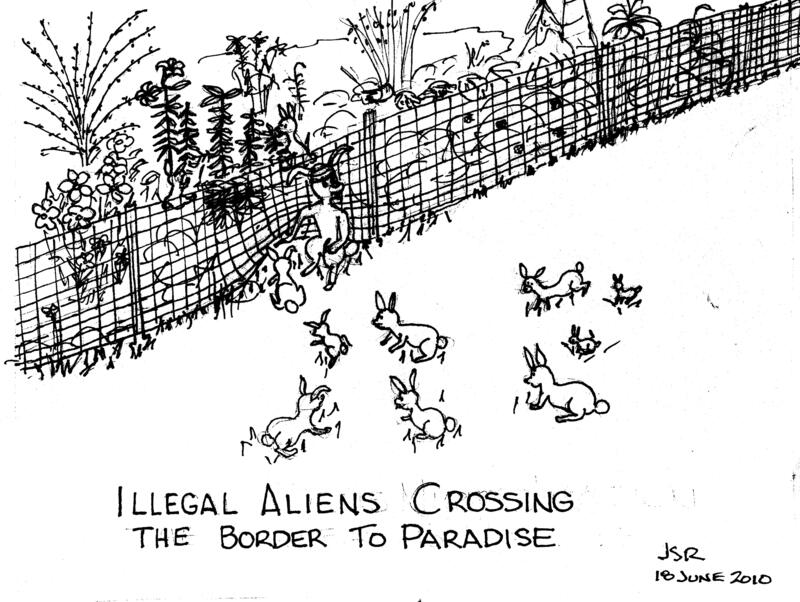 He plunked a few pots of yellow Lantana into the mix and hoped he wasn’t buying very expensive Wabbit food. A week after he planted the marigolds he noticed a few plants doing poorly. He got on his knees to get close to the ground. The foliage on the plant was gone. All that remained were the stems. Hmmnn! Where have I seen that before? Oh Yes, in my very first garden on Keeler Avenue I planted a line of Marigolds and they looked the same as this one. It took me a lot of research to find the culprit of that mystery, and when I did, I didn’t want to believe it. The garden has many critters, he thought. For every plant I buy a specific bug or predator exists to take it out. Now a new battle begins, and I’m afraid it involves chemical warfare for this terrorist. I can have no mercy on this tribe. I must annihilate them in order for the garden to live on. The formula for this new weapon resides in my study, I must find it quickly. “Hey Chief, what will we call our new union,” asked Ali Bug-Bunee? 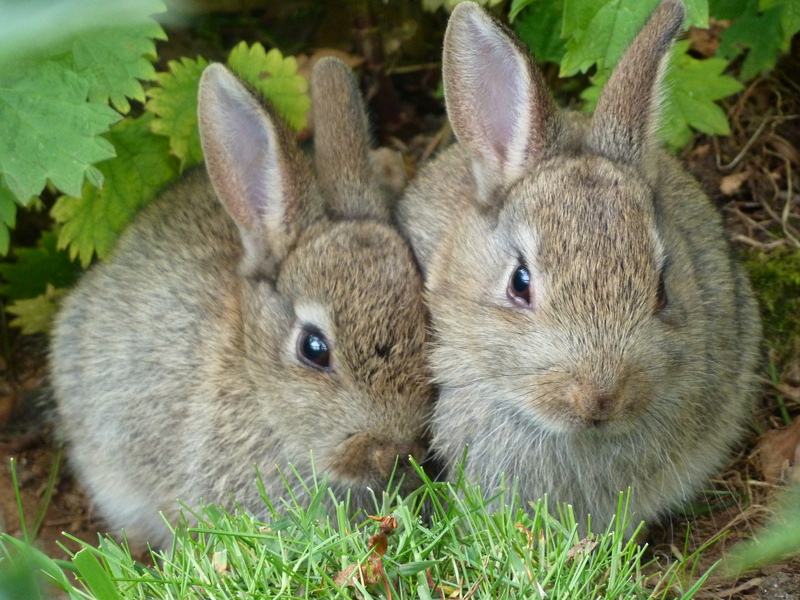 How about the Illinois Coalition of Wabbits, Insects, and Slugs, or “ICWIS” pronounced Icy-Whiz? Fifteen year old Alex Halprin throws a tizzy fit about going to visit his uncle in Illinois. He and his mother quarrel often, and this time his mother gives in. His parents and young sister leave for the weekend to drive the hundred and forty miles to Warren, Illinois near Galena. Alex looks forward to a lazy weekend of video games. He settles into his room when a loud crashing noise and a sudden shock to the house causes it to collapse around him and catches fire. Alex’s life changed dramatically because a volcano explodes in Yellowstone Park some thousand miles to the west and destroys his town of Cedar Rapids, Iowa, and everything in between. 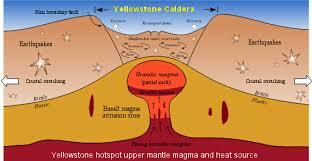 This scenario plays out in the book titled “Ashfall” by Mike Mullen. 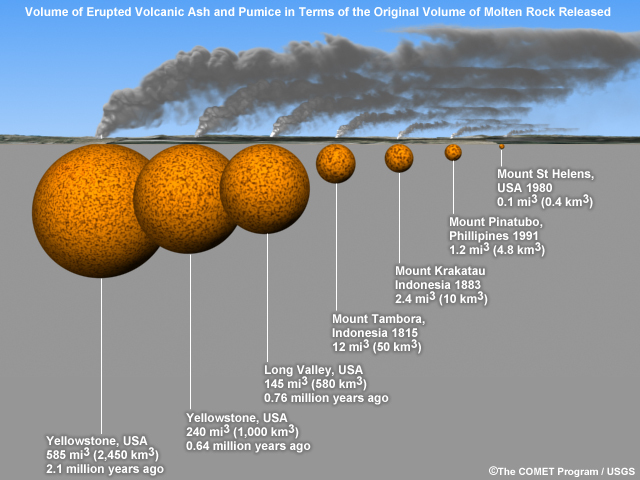 I mentioned it in my post “He Scared The Crap Out Of Me.” The whole scenario of what happens when a super volcano like the one lurking below Lake Yellowstone in Yellowstone Park explodes, fascinates me so I downloaded the book to my Kindle and couldn’t stop reading. If ever there is a case for keeping the Second Amendment alive and well along with our private firearms this is the reason. When the country, literally the entire country, is under emergency management, we will need our guns and ammo to protect ourselves from our neighbors, looters, and the government. Picture the moment when all power is out, two feet of ash covers the landscape and prevents all forms of transportation from happening, there is no communication of any kind, daylight turns into darkness for weeks, and survivors are looking for food, water, and shelter. Mike Mullins paints a fairly bleak picture about how society will react. Small towns will fare better, as will enterprising self-sufficient farmers. Big city folks are in trouble. In the story, Alex and his friend Darla finally come upon a FEMA camp and think they are safe, wrong. The camp is nothing more than a guarded fenced area with meager rations, nonexistent sleeping quarters, primitive pit toilets inhabited by thousands of starving people. Mullins convinced me that I should prepare for the worst and stock emergency provisions for my family. Oh yeah, I have to buy a gun and plenty of ammunition too. My story begins long after Obama begins to transform America, and his successor Hillary completes his father’s dream during her first term. She finalizes America into the totally mind numbing state of socialism predicted by Ayn Rand in Atlas Shrugged. Moving forward Hillary initiates a new movement she believes is smarter and stronger than socialism, she calls it factionalism. It is her premise that all members of society fit into one of five factions of personality. They are: 1. Abnegation for the selfless who renounce or reject all things. 2. Amity for the peaceful who believe all relationships are friendly. 3. Candor for those people who are honest and open in expression. 4. Dauntless for the brave, fearless, and determined. 5. Erudite for the intelligent who show great knowledge or learning. Hillary’s term ends before she has completed the factional transformation, and her successor continues with the plan. The successor uncovers a bug in the philosophy of factionalism, i.e. 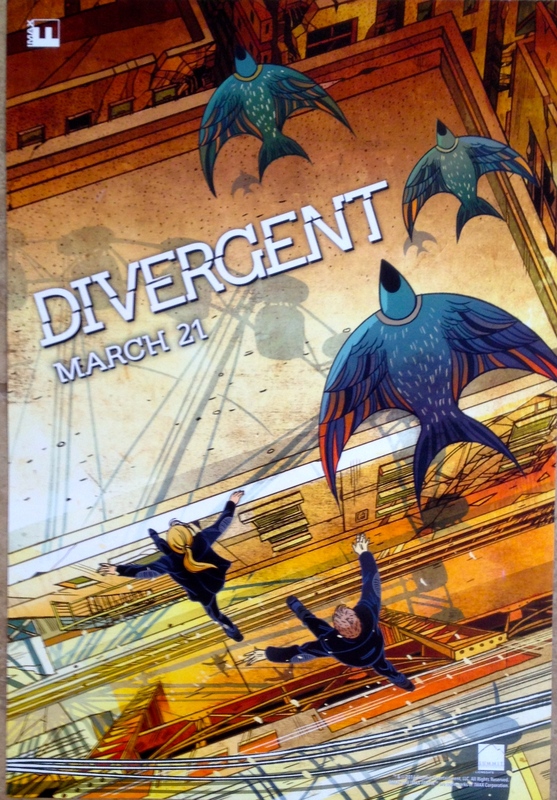 what happens to people who don’t fit in any of the five factions, she labels them divergent. They can think outside the box and reject being pigeon-holed into any of the factions. A Divergent is dangerous to Factionalism. There is only one way to deal with a Divergent, and that is to kill him. The narrative above is my attempt to presage the real story of “Divergent” written by Veronica Roth as a children’s story. Divergent is the current movie rage that had me on the edge of my seat throughout. It also started my mind spinning into the possibilities of reaching that point in civilization where such a scenario becomes real. The setting is Chicago, and the scene of the abandoned buildings on either side of a dry Chicago River bed gave it real meaning. This story theme reminded me of Hunger Games and its spin on what the world will become in the future. Each film is entertaining, but Hunger Games seemed more entertaining than Divergent. Perhaps it is because Divergent tells the story of a plebe seeking entry into Dauntless through a rigorous and brutal training program. Whereas, the Hunger Games was a more adventure filled, problem solving competition with no punches barred. Each film has merit and each tells a good story. Both are worth watching. Normally, Peggy and I don’t go for the sci-fi, fantasy, and comic book themed stories of the future, but this one had both of us riveted. Peg and I spent a beautiful day at the movie house and saw a wonderful film, “Saving Mr. Banks.” The only Oscar nomination it has received is for Music. That is too bad because the story is true and heart warming. Unfortunately, not all heart warming films become Oscar nominated films. The story covers the twenty year quest by Walt Disney to get the author of Mary Poppins to agree to let him make it into a movie. What I found most fascinating were the flashbacks into the author’s early childhood, and the influence her early life had on the characters in the story. In one scene Mrs. Travers arrives in Hollywood and stays at the Hollywood Inn Hotel. Disney sets her up with a suite and fills it with stuffed dolls of his cartoon characters and food baskets galore. She spots some pears in a basket and viciously throws them out of the window into the swimming pool below. In a much later flashback we learn that as a child she was happily bringing pears to her father when she learns of his death. Emma Thompson plays the role of Pamela “P.L.” Travers a pseudonym for Helen Goth. Thompson portrays Mrs. Travers expertly and convincingly. She is a complicated woman who is very possessive and protective of the characters in Mary Poppins. We learn that she is so because she based many of them on people from her life. She feels the slightest Disney depiction away from her invention is character assassination. Disney makes a heroic effort to convince Mrs. Travers to allow him to make the film, he promises her that he will not destroy her characters nor the context of the story. His motive for making the movie is a promise he made to his daughters. The promise is already twenty years old when this story takes place. I wonder if I would be so diligent as to spend twenty years trying to make good on a promise to my daughter. It takes a lot of persistence and doggedness to last that long. The characters in this movie got into my head and now I want to read the book to get a deeper insight into all of them. So many times we are left to our own imagination to fill in scenes between the lines. For example, I learned by reading that Mrs. Travers’ father played by Colin Farrell died from alcoholism. The film did portray him as a drinker, but I wondered if it was an addiction or because he was using alcohol to kill pain from some other malady. Maybe that is just me, but I thought the film did not make that detail clear enough. Perhaps it isn’t even relevant to the story, but it left me wanting. Throughout the story, Mrs. Travers maintains a cool unattached persona, but by the end she lets her hair down and befriends her driver Ralph played by Paul Giamatti. She actually let him call her Pam instead of the cold Mrs. Travers she demanded to that point. Tom Hanks portrays Walt Disney and even though he isn’t a 100 percent carbon copy of the man in likeness he makes it work. By the end of the first few scenes I believed he was Walt Disney. We enjoyed the story and discussed it over dinner and again over breakfast this morning. One major revelation came out of our discussion, Peg never saw Mary Poppins. When it came out her life and kids were beyond watching a film like Mary Poppins. Today, I will find a copy of the movie and we will watch it together. I give the film four stars. Aga Bam-bi hunched on the ground at the edge of the seed circle. His nose twitching as he chewed the seed. His ears continuously turning and twisting in all directions listening for danger. Grumpa Joe lightly tapped the window with a fingernail. Aga Bam-bi froze. He is bigger and fatter than Grumpa Joe remembered him from a year ago. He wondered where Aga Bam-bi was for the last twelve months. “He hasn’t found the petunias yet, that is good, but I’m sure he will,” muttered Grumpa under his breath. Deep inside the briar patch within the wetland Ali Bug-Bunee sat in conference with his cell. A full year had passed since the cell expelled Aga Bam-bi. The cell had remained in sleeper status during that time. The cell had been busy multiplying, and Ali faced a small crowd of cell members. Many of the newest members were still shedding their baby fur. Ali began, “The Nature Spy Alliance(NSA) has informed me that Aga Bam-Bi found his way back to the garden. 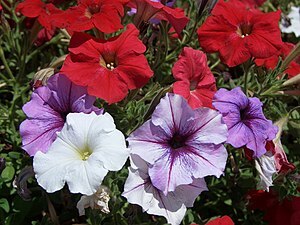 It is time to use Bam-Bi as a distraction while we execute our plan to devastate the petunias under the cover of darkness. Grumpa Joe does not know we are waiting to attack him. He will think it is Aga who is destroying his Vision. Put your ears at attention and repeat after me, “I solemnly swear to be active only in the darkness under the threat of being fed to the hawks.” They all fluffed their tails and wagged their ears in unison at the completion of the oath. Grumpa Joe finished planting the last six petunia plants near the window where he spotted Aga two days ago. “I’m taking my chances with this critter, but he has stayed away from the feeder for a while, and I feel confident that he won’t eat them.” As Grumpa Joe patted the final plant into place, he spotted Aga in the far corner of the garden eating clover flowers. “Now, now dear, he is only a poor little creature who lives a very hard life in nature,” said Peggy. The striped squirrels working for the NSA were listening to Grumpa Joe from under the stoop. Chip made a mad dash across the patio and through the Cranesbill into the wetland to report to Ali.